12/05/2014 – Update v3.4 is now live – Achievements are here! 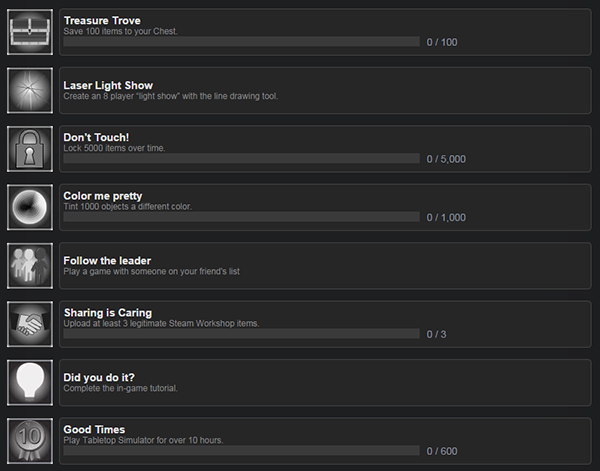 As a lot of you have noticed, we have added achievements to Tabletop Simulator. Hope you enjoy earning them! Good luck! If you have any good suggestions for more achievements, post on our forums and we may just add it! In addition, we’ve got some new goodies like toggling rotation snapping, height control, and overall general improvements. Be sure to check out our Tutorial Series to help you along your Tabletop Simulator journey!